Twitchell, D. P., Adkins, M., Nunamaker, J. F., Jr., & Burgoon, J. K. (2004, June 2-3). Using Speech Act Theory to model conversations for automated classification and retrieval. Proceedings of the International Working Conference Language Action Perspective Communication Modelling (LAP 2004), New Brunswick, NJ, pp. 121-130. Instant messaging, chat rooms and other forms of synchronous computer-mediated communication (CMC) are increasing in use in the business, military, and consumer world. The language action perspective provides methods for analyzing and modelling repeated business conversations including synchronous CMC. This paper describes a method for creating a profiles for large amounts of synchronous CMC conversation after it has occurred. Called a speech act profile, it is based on speech act theory. The profiles can be used either as patterns for classifying conversations or for creating visual maps of the conversations themselves. Application of the profiles in information retrieval and deception detection are discussed. This paper describes the theoretical foundation to speech act profiling and potential uses for the tool. No explicit research questions. The paper is a descriptive paper of Speech Act profiling and the theoretical models it is based on with a brief explanation of the foundational theories leading to Speech act profiling. Language Action Perspective (LAP), which models business conversations, is based on two theories: Speech Act theory and GoldKuhl's predefines speech act patterns, which are not described in this paper. These following claims are suggested but not tested in this paper. The paper defines how speech act profiling is done. These methods [dialog act modeling and illocutionary act potential] create a set of summed probabilities for each speech act type during a conversation, which are then subtracted from the training corpus average to obtain divergences from normal speech. The speech acts used are the 42 dialogue acts in the modified SWBD-DAMSL tag set (Jurafsky, Shriberg, & Biasca, 1997). 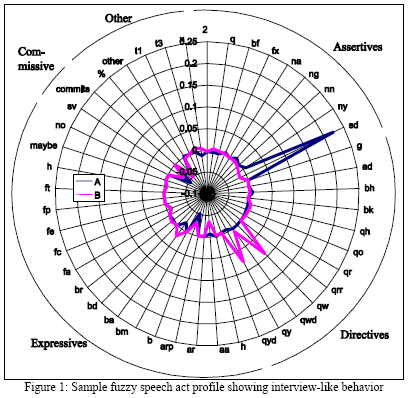 With the speech act potential probabilities and the categories of speech acts defined, a visual representation of the speech act profile can be created [in a radar graph]. Speech act profiling is one method that has been shown to be useful in discriminating between types of conversations including conversations with deception- induced uncertainty. It, along with other similar Markov-model-based techniques, may be useful in classifying conversations into more general framework, giving researchers and managers the tools to manage the millions of conversations produced each day. For researchers, not having to code conversations for intent by hand is an important labor-saving feature of conversation classification. Anyone continuing the research using speech acts profiling should be very familiar with all the theories and authors mentioned in this paper.